It is the last day of February today. This winter is colder than usual. Rain has stopped in Kyoto, but it seems to be snowy in the Kanto area including Tokyo today. I hope season will change to spring from tomorrow, March. What do you think the route above? 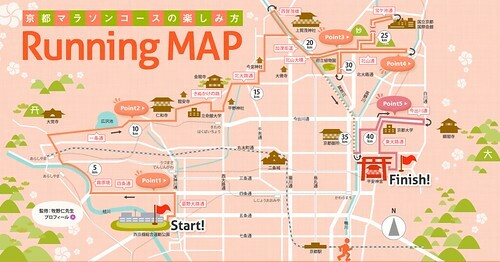 This is the route of Kyoto Marathon which will be held on March 11th. There are some famous temples and shrines along the route. Runners could run while feeling to be in the old capital. One more thing of which is different from other marathons in the city like a Tokyo Marathon is to run while looking at beautiful mountains closely. 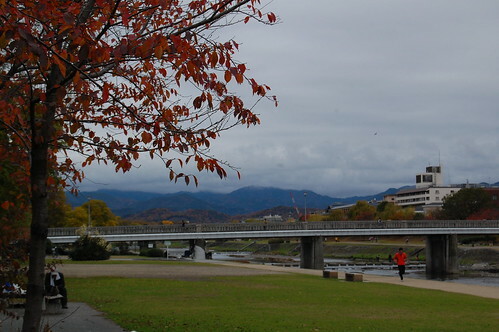 The best place to see the mountains for the runners and look at the marathon for we supporter would be on the riverbank of Kamo River. (photo below) Of course I will go there, around the Imadegawa area which is almost center of the Kamo River the runners will go through. Some of my friends will run. I hope their safe running!